The Hittites - Who were the Hittites? Perhaps the greatest empire for which we know the least about is that of the Hittites. At their height, they rivaled the Egyptians in power and were even able to sack the Amorite city of Babylon around 1585 B.C. But unlike Egypt, the Hittite civilization left few records or monuments as an enduring testament. Their ascendancy began around the 18th century B.C. in Anatolia (modern-day Turkey) and their end came just as mysteriously in the 12th. They established a capital at Hattusa on the Halys River (also called Kizil Irmak). This city was unearthed in 1906 by a team of German archeologists and thousands of cuneiform tablets were discovered. Many of them are royal archives and date from 15th to 13th centuries. In 1925, more tablets were found at the ancient city of Kanesh (modern Kültepe) which are much older. Written in Assyrian cuneiform, they are the correspondence between Assyrian merchants and local rulers. These date to the 18th century and it is here that the Hittites are first mentioned. So it is possible (even likely) that their civilization is even older, but at this time, they are starting to get their neighbors' attention. How did the Hittite Empire end? That's not entirely clear. However, a look at the chart reveals two interesting events. 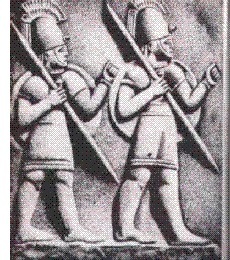 The end of the Hittites corresponds roughly with the rise of the Assyrian Empire, one of the first aggressively expansionist empires in history. So they may have declined at the expense of the Assyrians. The other is the Trojan War fought roughly a century before end of the Hittite civilization. The city of Troy was situated in the Northwest corner of Anatolia. Some historians have theorized that the fall of Troy opened Western Anatolia to invasions from across the Hellespont by Indo-Europeans, and these invasions brought increasing pressure on the Hittites.